On December 11 is the National Noodle Ring Day. A noodle ring is a ring-shaped casserole made with pasta, cheese, and eggs. The noodle ring is made by mixing noodles and eggs together with cheese, ketchup, Worcestershire sauce and other ingredients. The mixture is put into a ring mold and baked. The ring is served on a large plate. Its center can be filled with vegetable stew, creamed chicken, steamed mushrooms or other ingredients. The noodle ring used to be popular in the mid-20th century. Unfortunately, it has lost its popularity since them, probably because simple mac and cheese is much easier to cook. However, if you decide to celebrate the National Noodle Ring Day, a ring-shaped pasta casserole might be a great treat for your family. 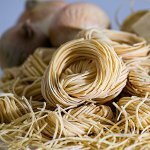 How to cook a noodle ring? First, preheat oven to 350 °F. Cook 8 ounces broad egg noodles in salted water until barely tender. Drain the noodles. Defrost 2 packages frozen chopped spinach and drain well. Mix noodles and spinach. Saute 1 chopped onion in 1/2 cup butter until lightly browned. Fold in 3 lightly beaten eggs. Add 1 cup sour cream and blend well. Grease a 6 cup ring mold. Pour mixture into the mold. Place it in pan of hot water and bake for about 45 minutes. Carefully unmold the noodle ring and serve on a heated platter.